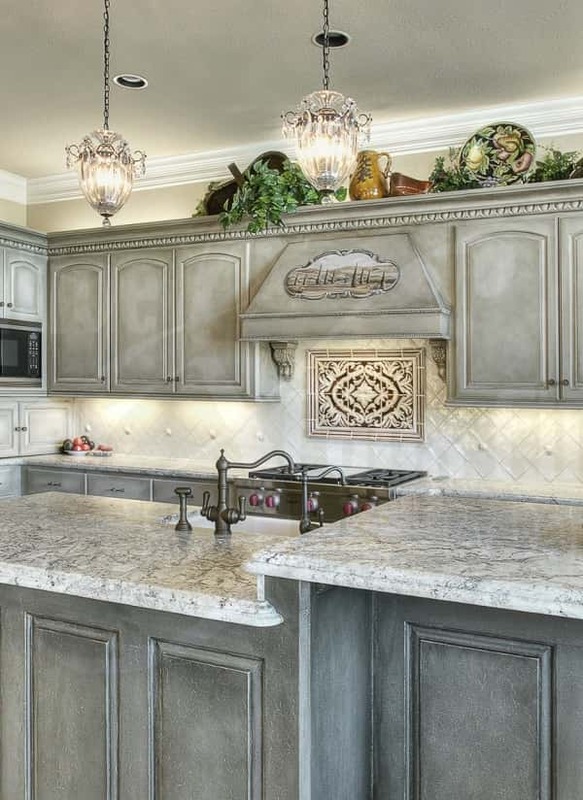 If someone is asking about, ‘what is the most popular home’s improvement today?’, the outdoor kitchen will be the top list’s answer. It is so common today to see families having a joyful cooking and dining time while enjoying the warmth of the spring. It is indeed an exhilarating space to have fun. 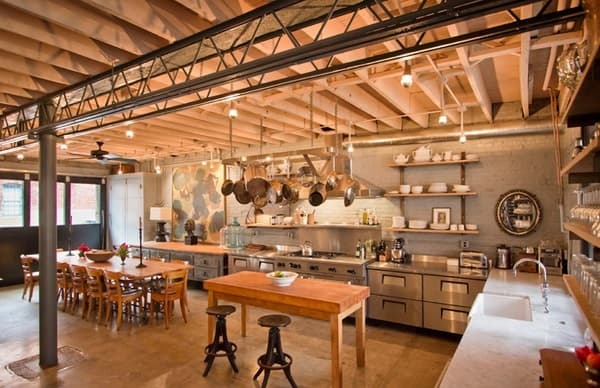 The kitchen is known as the ‘center’ of the house, or some say it is the ‘heart’ of a home. 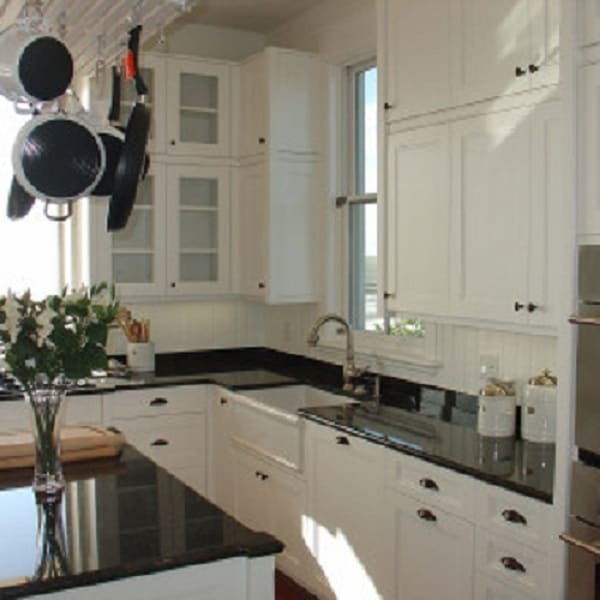 It is because in the kitchen where all the family members can do many joyful activities that the room is called so. Besides works as the place where you can cook something, you can also catch up your documents, read some news, kids do their homework, and so on. When you have an outdoor kitchen, the place becomes way more fun. Doing all of those things while enjoying the fresh air feels really great. 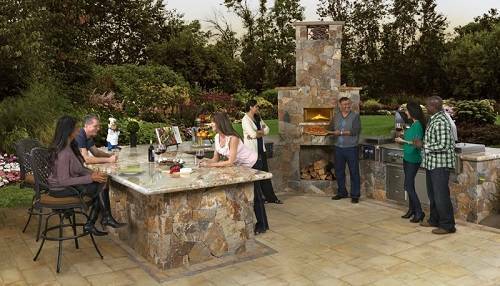 So building an outdoor kitchen is never a bad idea, or if you already had a patio, just add some kitchen furniture on the space. There are some things that you have to put in the outdoor kitchen like a grill, a mini refrigerator, a sink, and so on. It is, of course, important to make your outdoor kitchen looks outrageous. 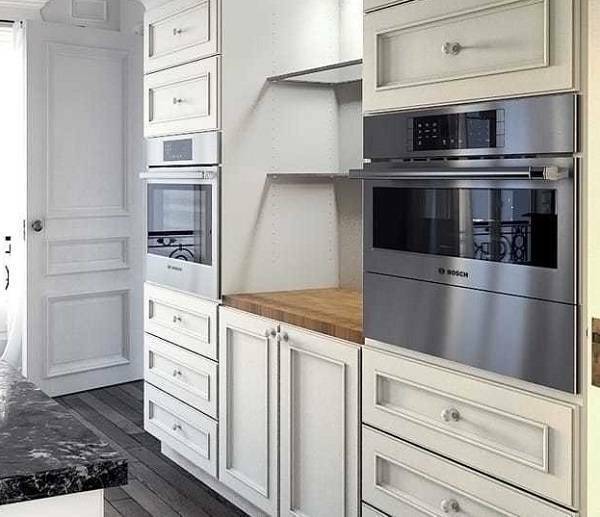 You have to choose some dazzling outdoor kitchen’s stuff to install. Sink is one of the outdoor kitchen’s basics. 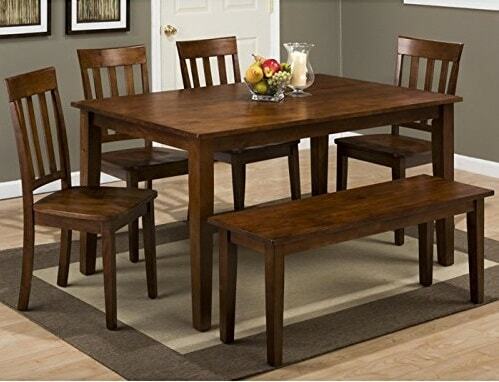 It will make the space more functional and enjoyable, so choosing the beautiful one is a must. 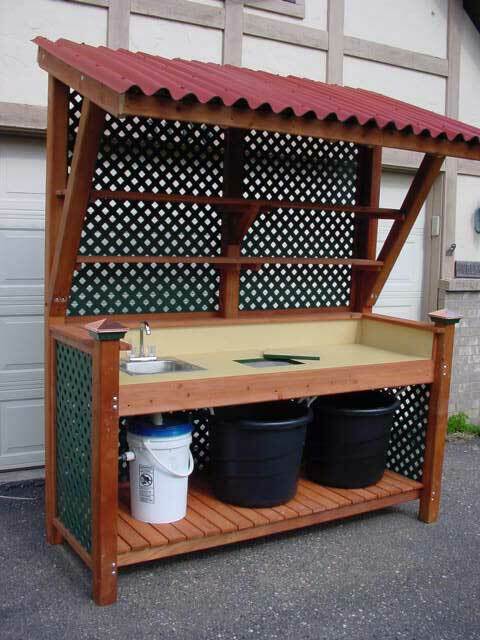 Here we have some outdoor kitchen sink station ideas that you can build in your home. The gorgeous outdoor kitchen sink station with canopy. The wooden lattice design gives such a Mediterranean style to your outdoor kitchen. Adding some plantations on the lattice will be a good idea to make it look more natural. 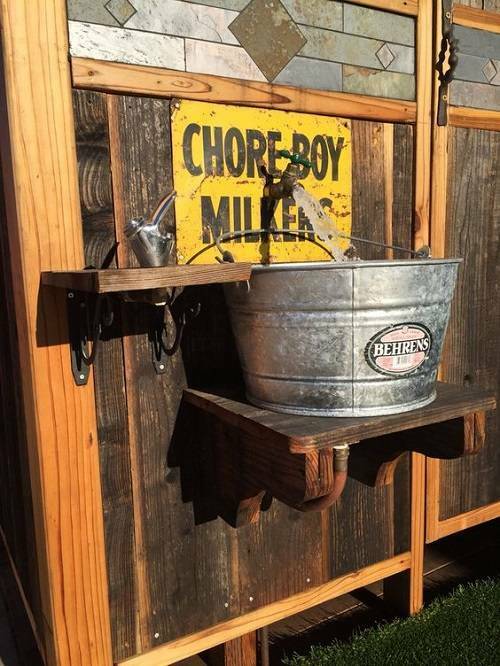 This lovely sink station will make your outdoor kitchen looks way more inviting. The gray choice gives such a calming atmosphere around the space. The storage space is very useful to put in some backyard’s stuff inside. 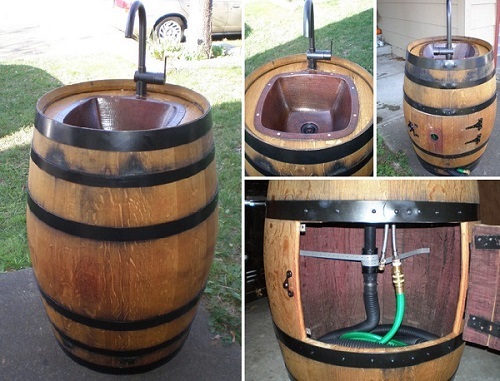 The brilliant idea of reusing a wine barrel! This outdoor sink looks very creative and stylish to put in your outdoor living space. It creates such a classic touch to your backyard. 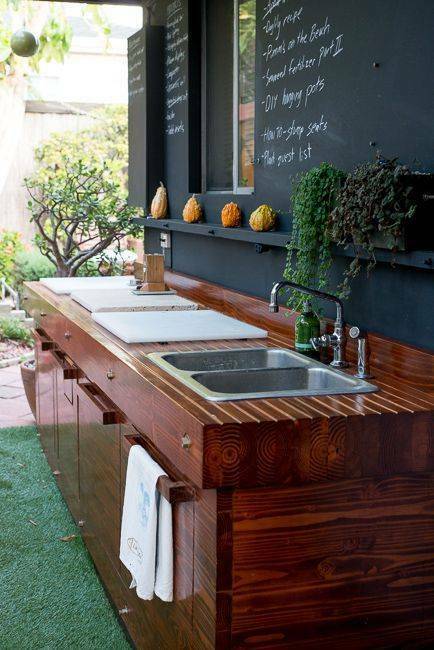 The horizontal wood slats design of this outdoor kitchen sink station looks modern and elegant at the same time. It is a good idea to give a contemporary style to your outdoor space while still keeps the natural atmosphere. Perhaps this one is more suitable if you love something eccentric to put in your outdoor kitchen. It just uses a steel milk bucket and just simply make the base for the bucket from wood boards. 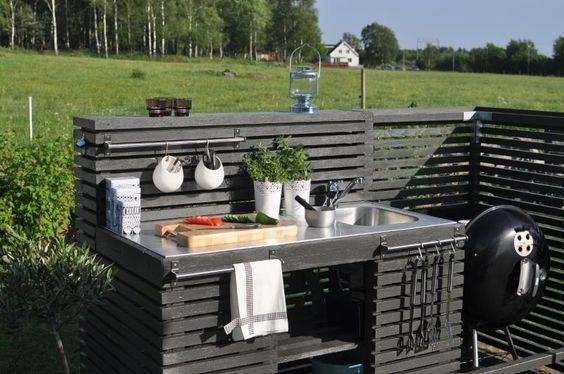 Such a creative way to build an outdoor kitchen sink. 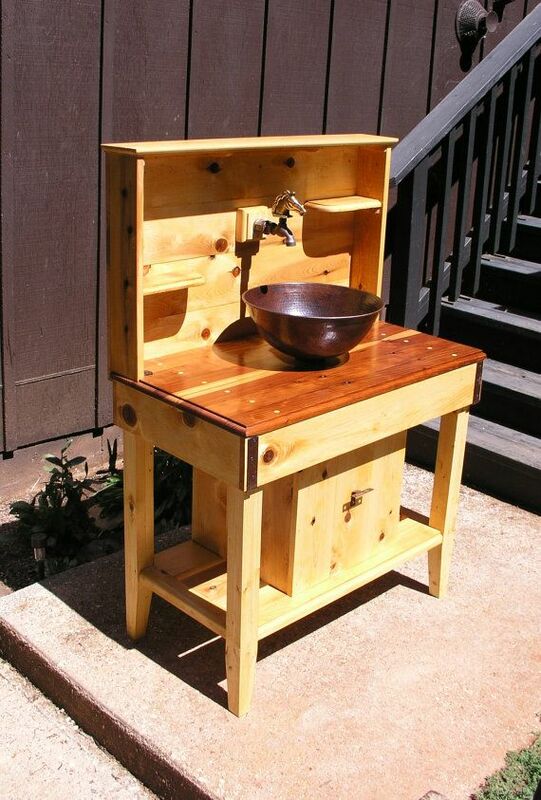 The gorgeous outdoor kitchen sink station made of wood. 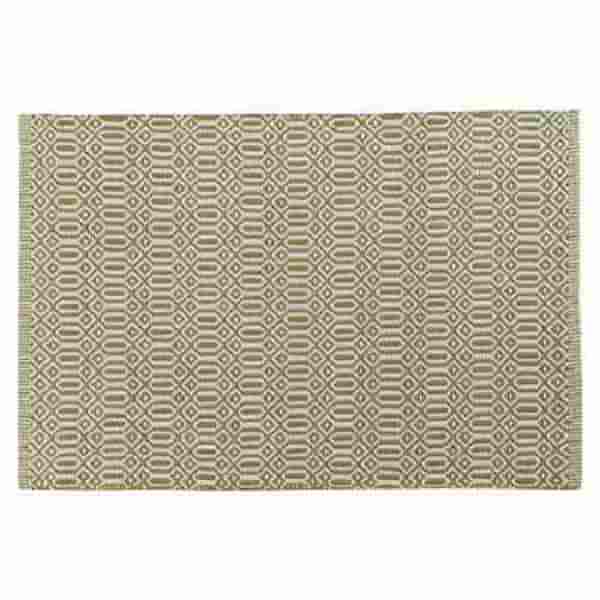 It matches beautifully with the outdoor surrounding and the plantation makes it look more earthy. Write some recipe, menu, reminder, to-do list, or to-buy list on this huge chalkboard which beautifies the style of the outdoor kitchen sink station.The solid wood of the sink station looks so attractive and sturdy, and adding the chalkboard makes it look more creative. 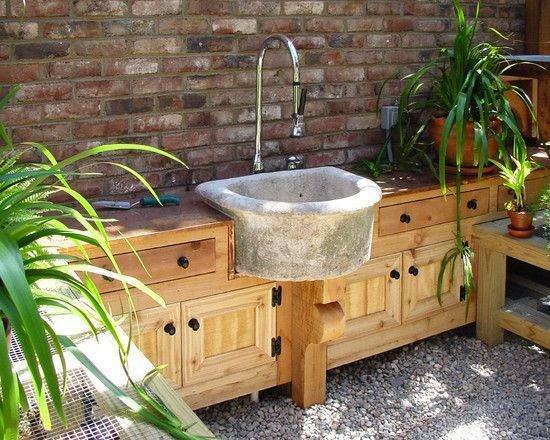 Another wood sink station which looks gorgeous and this one could also work as a fence at the same time! 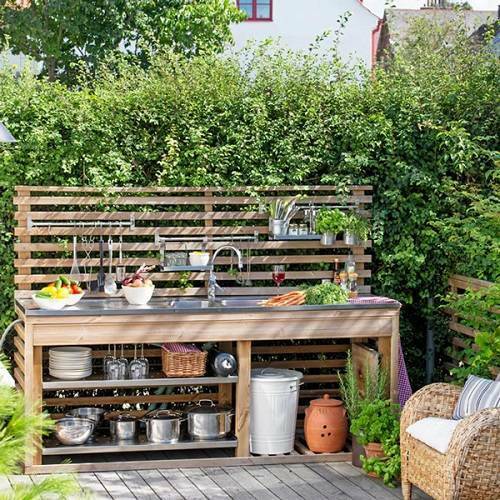 The horizontal wood slats fence is commonly used to decorate a backyard, and installing a wood sink station on it is a great idea. The bushes enhance the natural sense and privacy to the outdoor kitchen area. 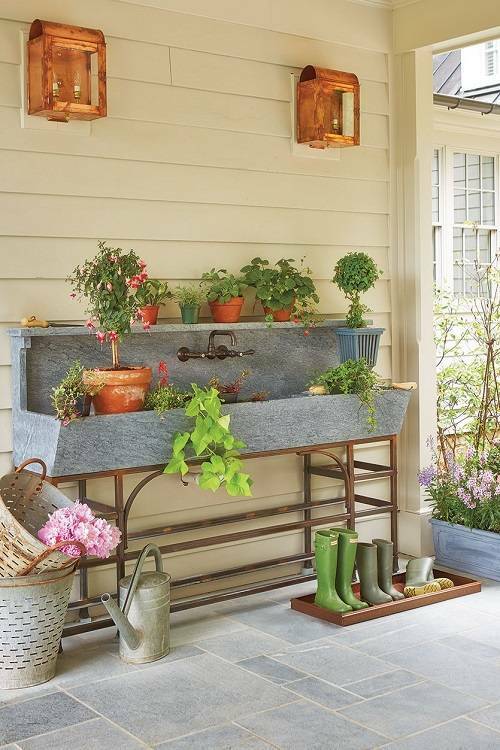 This fascinating outdoor sink station is a great option to make your outdoor space looks distinctive. The combination of wood and stone never goes wrong to create a natural atmosphere in your property. The design of this sink station takes us to the Flinstone’s world. 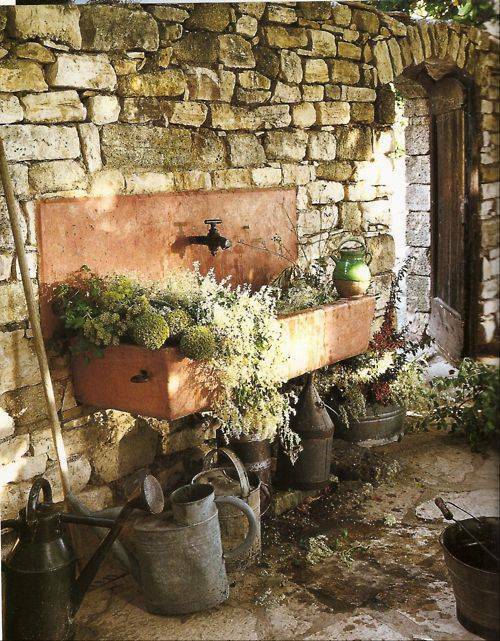 The classic boho-themed outdoor sink station which looks so adorable. It is a good idea to create a whimsical outdoor look. 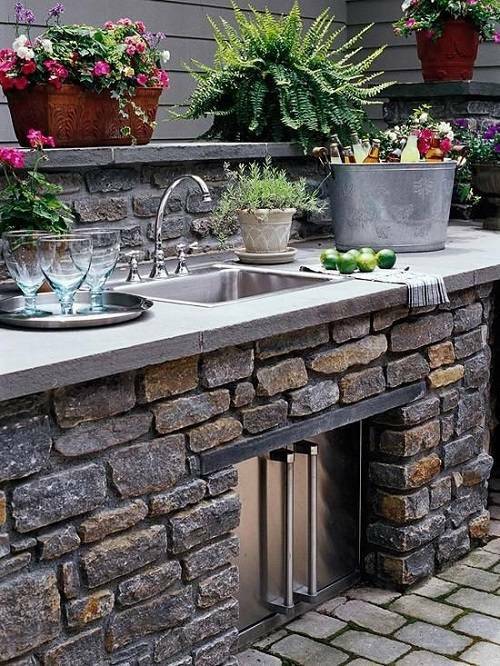 The rustic bricks material of this outdoor kitchen sink station is so extravagant. The metal door which leads to the storage space under sink enhances the attractiveness of this sink station. 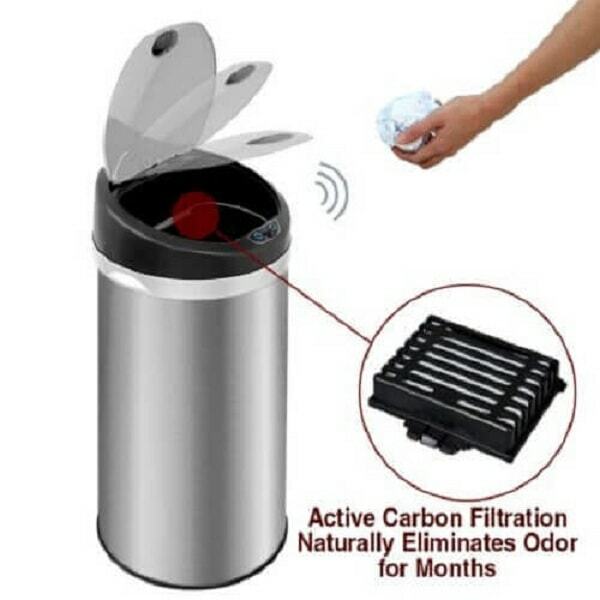 It will give such a premium touch to your outdoor kitchen. 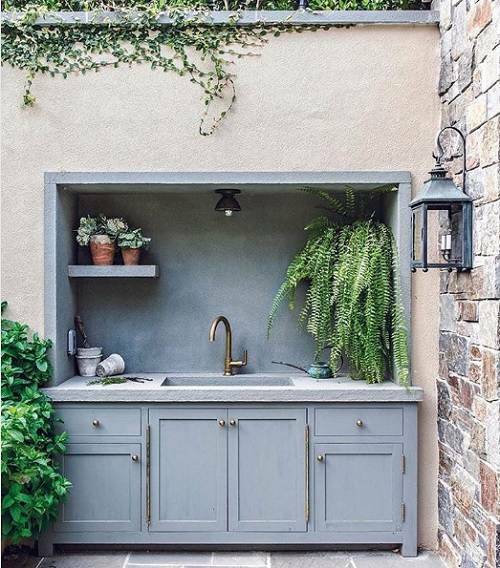 This sink station looks beautifully simple and obviously flows with the natural surrounding of the outdoor kitchen. There are a lot of storage space featured in this sink station design. 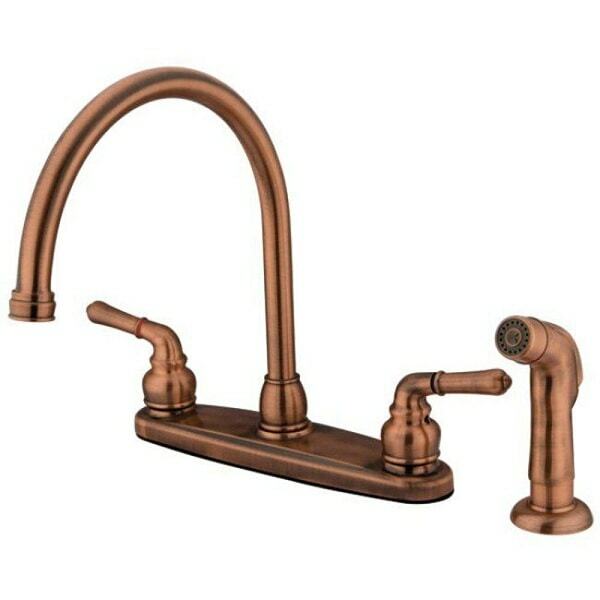 The contemporary faucet style gives an elegant touch to the sink station. 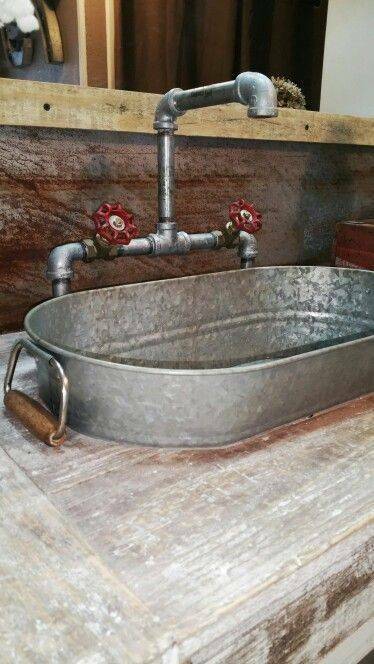 The unique outdoor sink station wich uses the oval galvanized bucket with an industrial pipe to run the water. It is such a creative idea which will catch so many attentions. 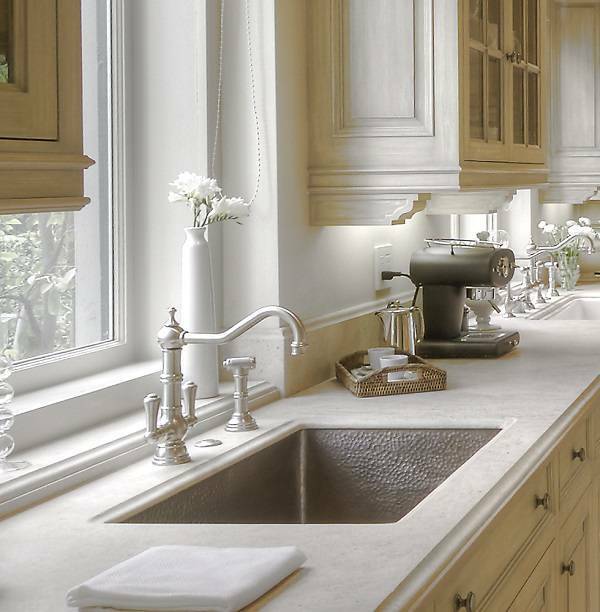 The sink style is simple yet attractive. 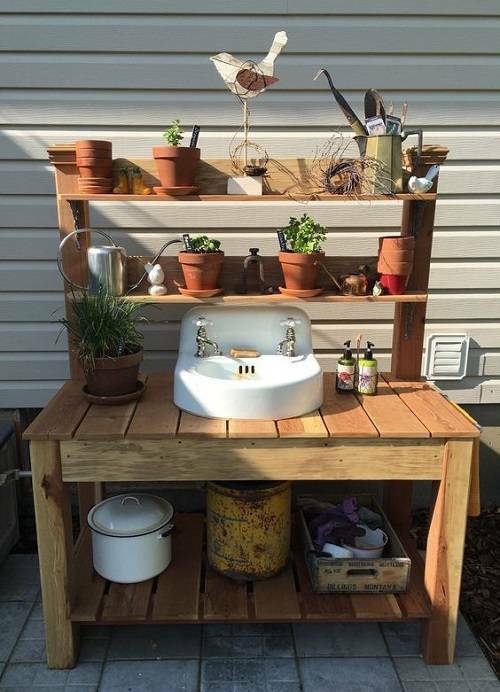 Another outdoor kitchen sink station idea which uses a neglected stuff. 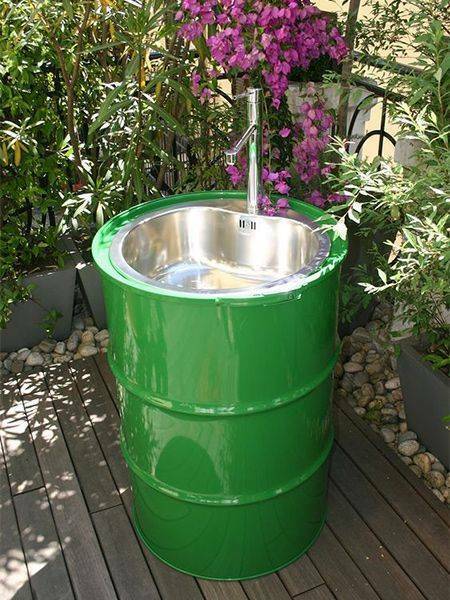 This oil drum is turned into a unique and dazzling sink which works best to place in the outdoor living space. 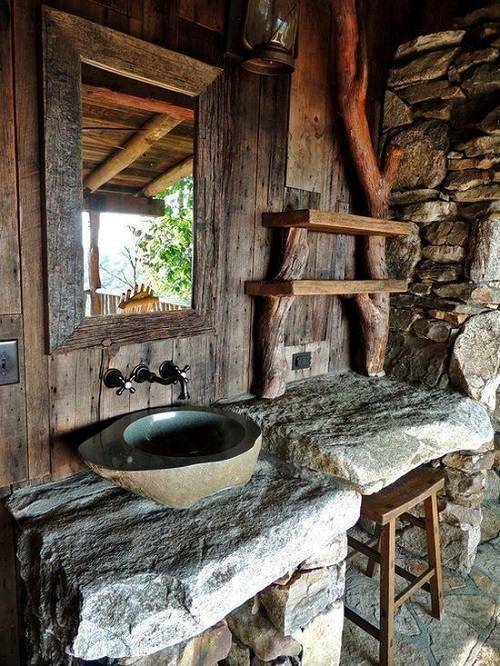 This is a gorgeous stone table which functions as a sink station. It looks attractively classic, and the plantations around gives a beautiful natural touch. 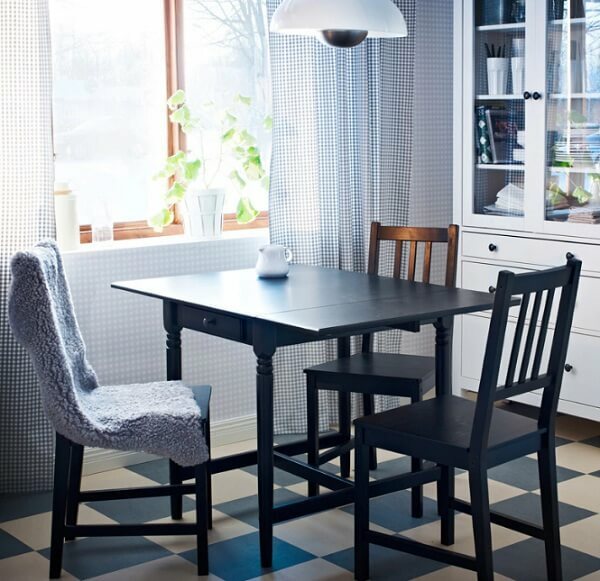 It is a good choice to match with your 80’s property’s style. Having an outdoor kitchen is like having you own ‘island’ where you can do some short vacation anytime you want. It is a space to entertain the family and friends in the summer. Always choose the right kitchen’s furniture which has benefit function and has the attractive style to beautify your outdoor living space. An outdoor kitchen is truly a great home’s investment, it will enhance the house’s value especially if we design it as best as it can be. There are things to consider in building an outdoor kitchen like the material, style, design and size of the outdoor kitchen that you want to get.